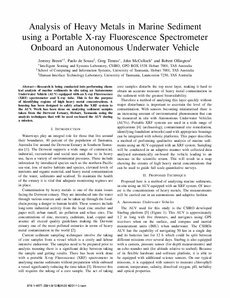 Research is being conducted into performing chem- ical analysis of marine sediments in situ using an Autonomous Underwater Vehicle (AUV) equipped with an X-ray Fluorescence (XRF) spectrometer and X-ray tube. This is for the purpose of identifying regions of high heavy metal concentrations. A housing has been designed to safely attach the XRF system to the AUV. Work has been done on analysing sediment samples taken from the Derwent Estuary, Hobart, Tasmania using the analysis techniques that will be used on-board the AUV during a mission.